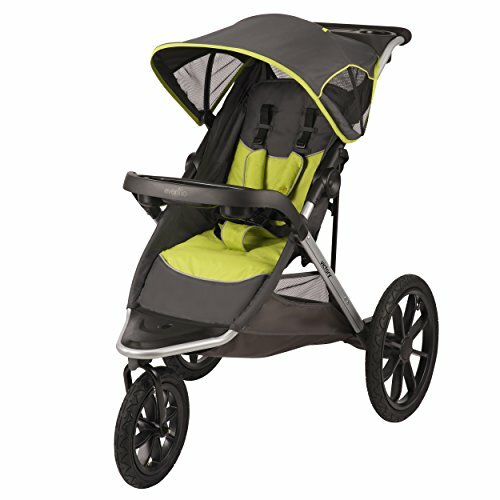 The Evenflo Victory Jogger inspires you to take baby along for the ride whether your running errands or going for a jog. Compact fold & lightweight, our 23lb JPMA tested jogger with our ultra slim 17" fold, makes it up to 10% lighter than the competition. Large pneumatic wheels that provide shock absorbing suspension for performance, durability and ease coupled with sleek, compact frame designed for all kinds of on-the-go situations. Compatible with the Embrace Infant Car Seat, offering an extended weight rating (4-35 lbs.) (sold separately) Additional features include: In seat fold, child tray with two cup holders and snack scoop, convenient parent console with two deep cup holders and covered storage, full coverage canopy for shade and privacy, convenient storage basket.Cleaning Instructions - DO NOT lubricate or immerse in water any part of this child restraint, unless rinsing is permitted. Plastic and metal parts may be wiped clean with mild soap and water and dried with a soft cloth. Do not use abrasive cleaners or solvents. Take care not to damage any labels. The harness can be wiped clean with mild soap and water. Allow harness to air dry. Machine wash the seat pad separately in cold water, delicate cycle. Tumble dry 10 to 15 minutes on low heat. Periodically inspect and clean the restraint's crotch buckle of food, liquids, and other debris to ensure proper latching. Place the buckle in a cup of warm water and gently agitate the buckle back and forth. Press the red button several times while the buckle is in the water. Do not submerge the harness strap. To avoid damage to the buckle, do not clean the buckle with soap or detergents and do not use a lubricant.